I like to change up the decor here at StoneGable! But one thing I have not changed in a long time are the bookshelves in the family room that flank the fireplace. Because they are the focal point of the back half of my home I did not want them to be too busy and full of books. Funny, a bookcase that is not really used for books. Books in this bookshelf would be very distracting in my bookshelf and way too busy! Today let’s talk about styling bookshelves without using books! 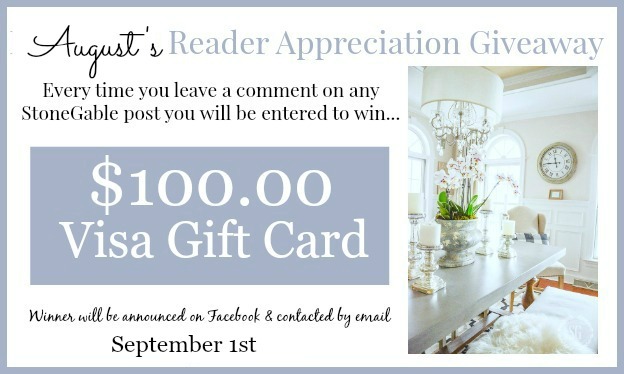 Don’t forget every time you comment you are entered to win a $100.00 VISA GIFT CARD! Congratulations to BUNNY for being July’s Reader Appreciation Winner! Good luck to everyone commenting this month! Today on Decorating Tips And Tricks we are talking about EASY FIX WINDOW TREATMENTS. This is a must listen to!!!! We all have windows and we have some great ways to enhance them that are simple and very inexpensive! 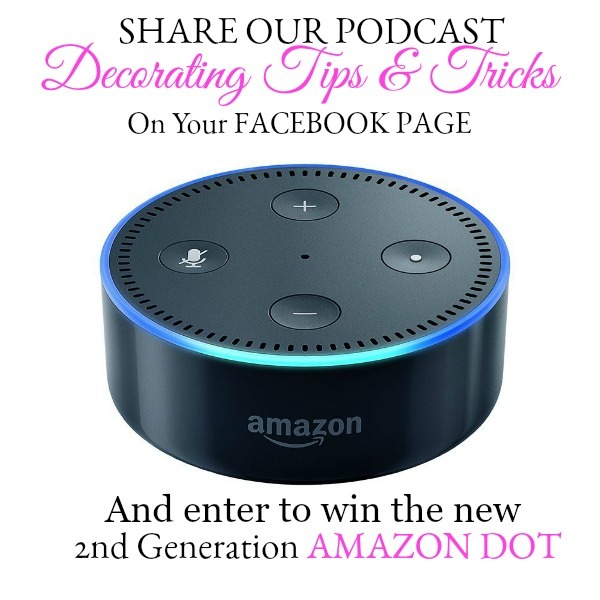 And please enter our Podcast Giveaway HERE. 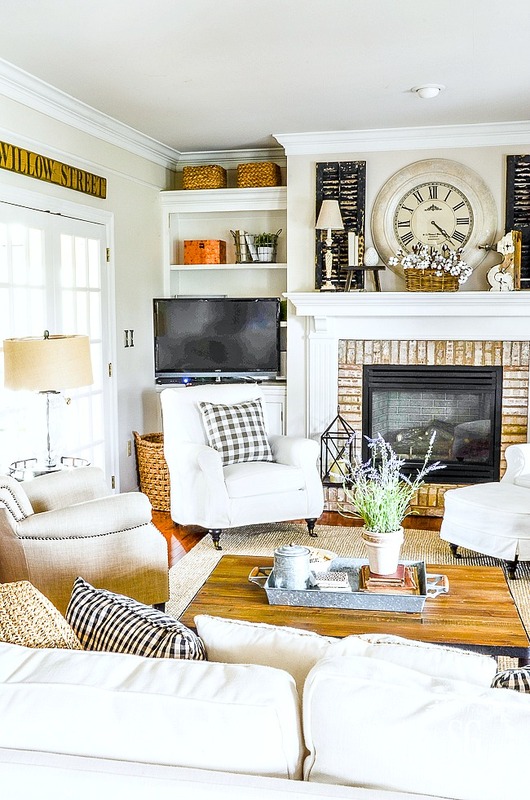 My family room is very neutral and has a relaxed refined farmhouse feel. So it was important to keep the bookshelves the same. I think I like the bookshelves equally as well. I just needed a change. I must make a little confession, I did use books. White painted and burlap covered books. They can still be read, but they are not really for reading at all! I use them as a decor element. 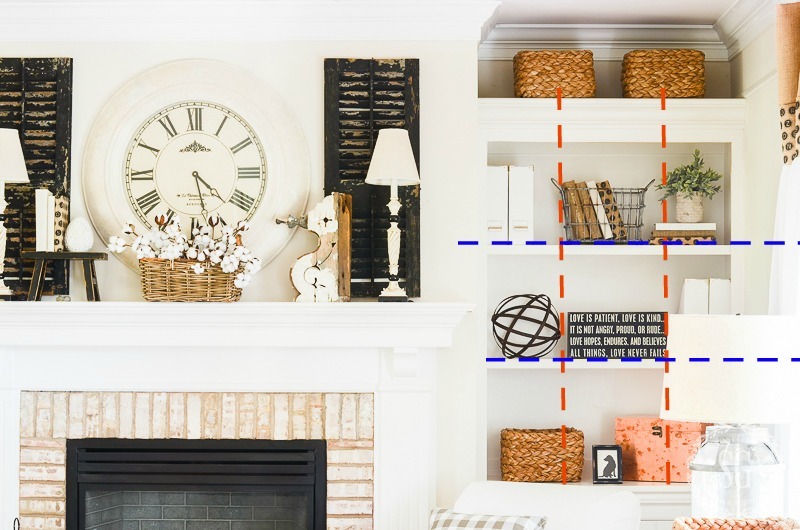 My favorite way to tackle any bookshelves, hutch, or open shelves is to visually divide them into equal sections. And then I fill in each “box”. I divided this bookshelf into 9 boxes and worked with items in a very tight color palette. Whites, neutrals, blacks, and browns. Just like the rest of my family room. Some of the decorative items spilled over into another box, and that’s okay. I didn’t want to make it look too rigid! This beautiful copper chest will tarnish and age into a soft brown/copper. It will get better and better with age. I have a smaller chest just like it on the top shelf of the opposite bookshelf. See the image of the whole family room above. Did you notice the magazine holders on the bookshelves? I love magazines! And I can keep them out of sight and organized! You can see we put our television in the bookshelf left of the mantel. It made sense there. I know it can’t be helped much of the time, but I am not a fan of a tv over the mantel. I love anything organic in bookshelves. And again, on both bookshelves, I have a small faux green plant.Ikea has really nice for faux plants and little white pots to put them in. It is also important to vary the heights of the things I put on a bookshelf. 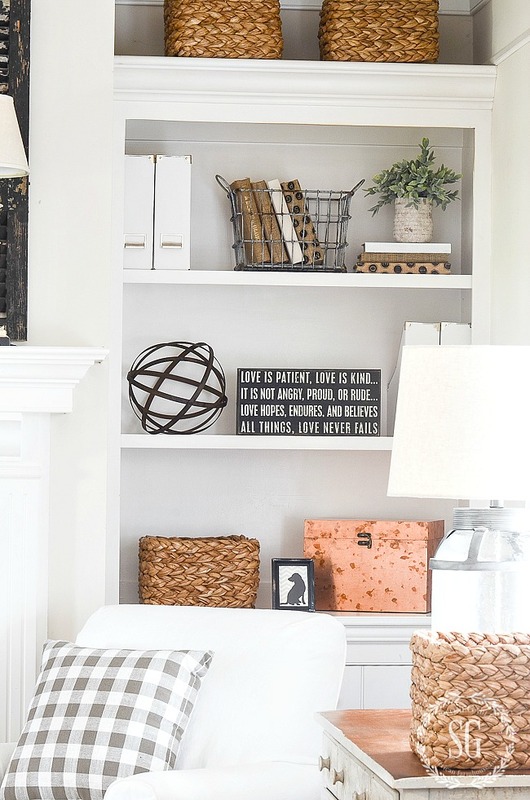 Even though there are no books that we actually read on these shelves the stacked decorative books work so well as risers and bring an element of cohesiveness to the design. I bet you are wondering where we keep our books? We do have other bookshelves in our home. My study and our upstairs sitting room have bookshelves. Do you have a room with bookshelves that look cluttered? 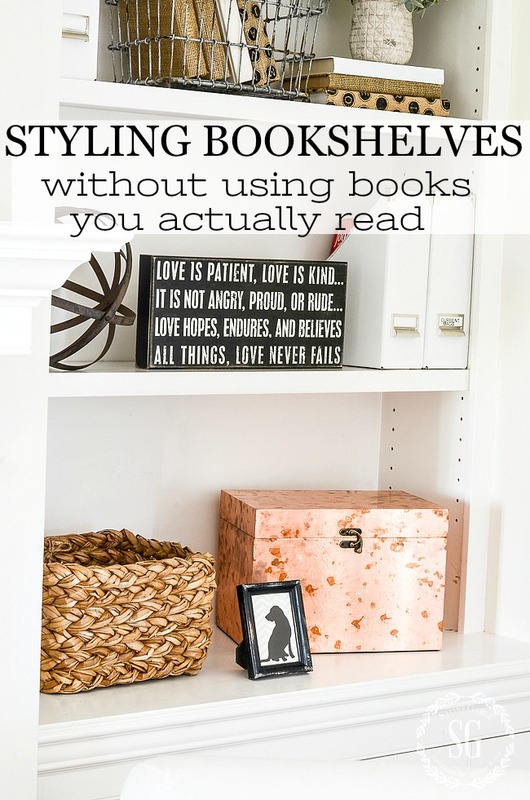 Why not try styling them and then stashing your books elsewhere! Here’s a decor challenge… Find your messiest bookshelf, clean it out and style it… with or without books! Very beautiful, love putting other items on the bookcases rather than books. Never a TV over the mantel – if there were no other place for the TV then NO TV – problem solved !! Bookcases can be so tricky sometimes – simple and pretty ideas !! I love the little copper chest! So pretty! I have been using your 9 box graph from when you put it out there awhile ago. Oh my goodness, what a help that bit of advice can do! It has made a huge difference in my home. My bookshelves have never looked better! Any shelves for that matter. Thanks for the great advice! Love your new look on the book shelves… I just got some books at half price books to use as decor.. have not decided if they are going to get painted or covers taken off or covered in fabric. Thanks for all the great tips. I like the refresh! I also like Bunny’s suggestion. Maybe that would be a good compromise for those that feel a bookshelf needs to have books? I have many favorite art books as well as books from childhood that I love and display along with family photos, mementos, antiques and collections in our study. 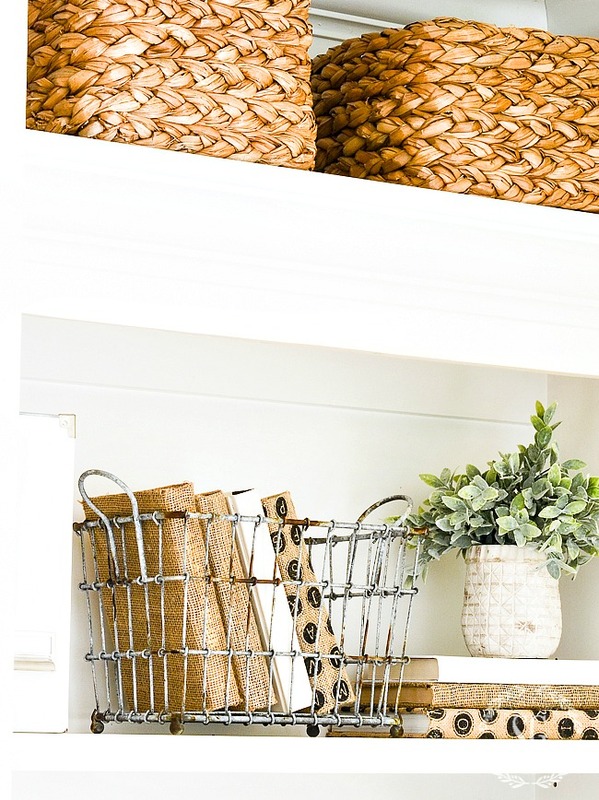 I like the look of the baskets you incorporate into your shelving, but I have no more room. Congrats on your feature and hope you continue to heal. 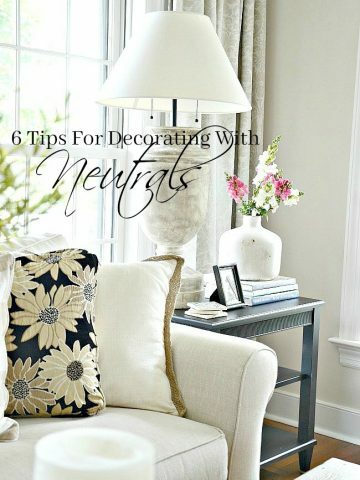 As a home decorator, I love the styling of your bookshelves! As a librarian…what? Books, Books, Books! In our “new to us” home, we have two sets of built-in book shelves. The one in the office is similar to yours in that there is a fireplace flanked by bookshelves. These are crammed with books! Books to read, books for research, books to save (authors I have met), books for the grands, etc. The set of built-ins located in the dining/living area are my challenge. I have books on the shelves, but I really want these shelves to be more for display. I’m struggling with making them look…lovely. I don’t want them to look like I went to a retail store and stocked up on “stuff.” I love looking at some of your ideas! BTW – I have painted books for displays on table tops and they look great. I’ve also stenciled and embellished some. I love your burlap covered books, however! I love your bookcase styling and congrats on your feature Yvonne!!! So exciting!!! 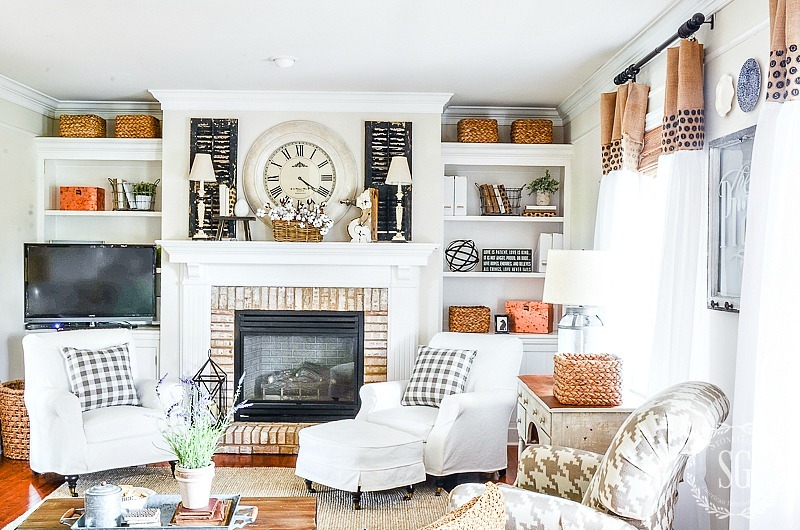 Beautiful as always but I love the corbels used as bookends. 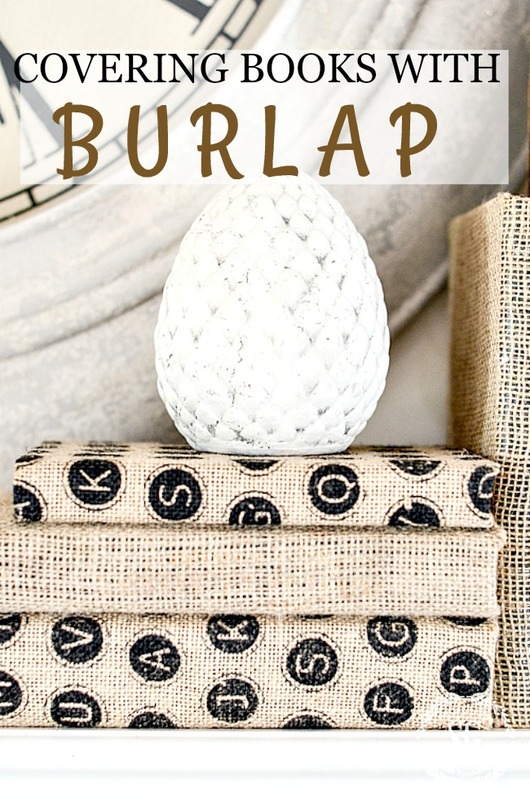 I have been covering books with burlap ever since you posted the how- to’s last year. LOVE the look and addition of texture to wherever I display them. Thanks again! Hi Yvonne, I can’t imagine a bookshelf without books on it! I have LOTS of books, in just about every room, but have made an effort to make them more attractive, adding baskets, boxes, and pictures–and alternating how the books are stacked or shelved. I like the idea of dividing them into “sections.” Thanks for your good ideas. You have a beautiful (and much larger than me!) home. Blessings! Exactly what I needed to see! I’ve been arranging and rearranging shelves and just haven’t gotten it quite right. Thank you for the inspiration! Great ideas for bookshelves. I have a large “built-in” bookshelf about the size of both of you bookshelves together flanking one side of our fireplace in our family room. I use to decorate it before I started homeschooling, then I needed to utilize it for many books and other supplies. 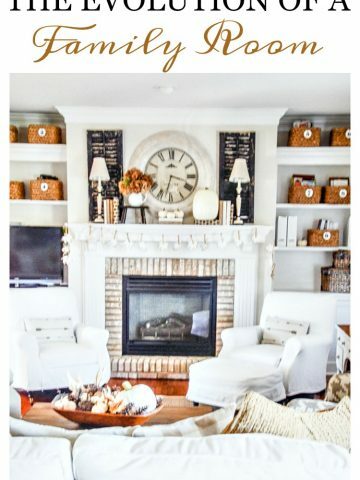 Now that I’m finished homeschooling, I’m wondering if there’s a way to both decorate and use baskets and/or boxes to store things that are now being used in that area? Do you have ideas? I like your new look, Yvonne! I have a formula for bookcases or shelving that has worked for me over the years…display 1/3 of the space with books, 1/3 of the space with accessories and 1/3 should remain empty. This works every time and guarantees an uncluttered look. I just MUST comment on my good fortune!!! I am the excited winner of Stone Gable’s July gift card. Keep leaving your comments, ladies. YOU could be next!!! I feel like a celebrity. Wow, Bunny! LOVE this formula! 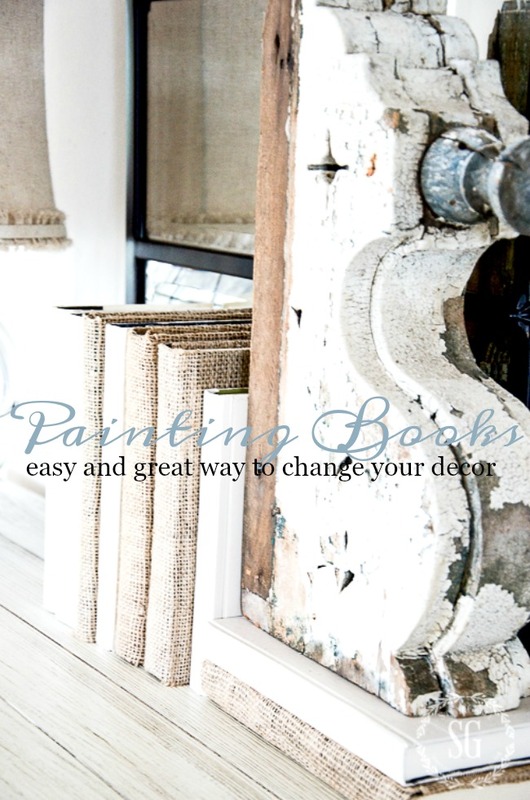 I’ve covered books with burlap in the past but never once thought about painting them – what a clever idea. You can disagree Lizzy. For me, all I can see is a big clutter of books. A friend did it for me! She does have an etsy shop. But I don’t know what it is called. I’ll try to locate her. 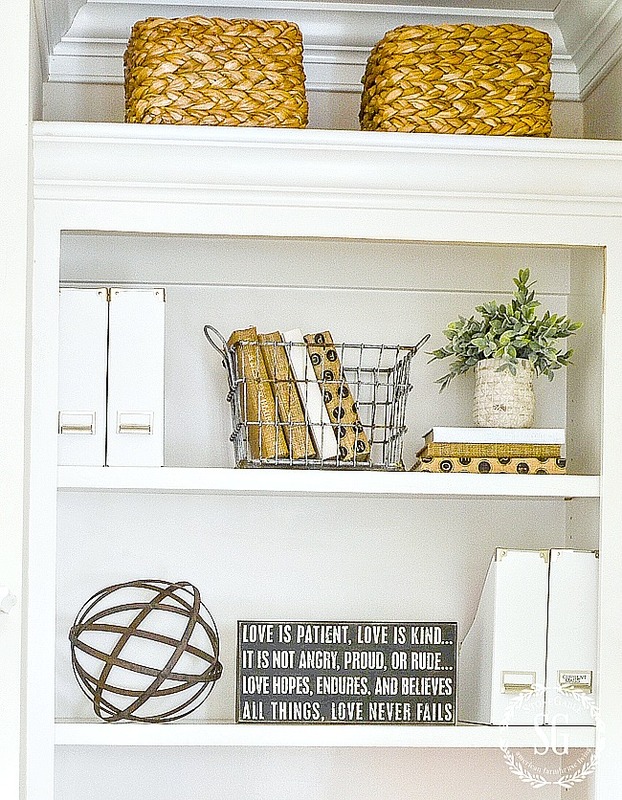 I love how you divided the shelves into boxes…..great idea!! I don’t have books on my book shelves either….just things I like! great ideas , love your “love is patient…” sign! Great tips, Yvonne! Where did you get the copper chests? I’ll be sharing that soon. 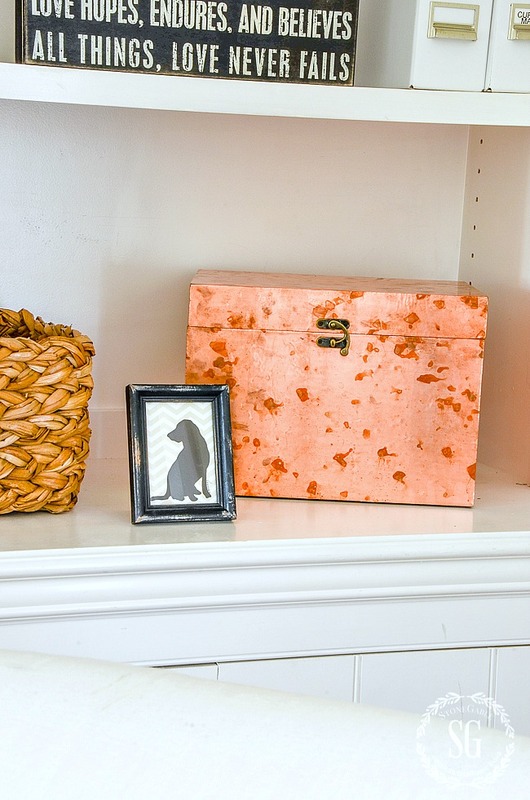 Doing a little family room refresh soon and the copper boxes are part of it. Really like the baskets. Am constantly rearranging, will get it ‘right’ eventually! Real quick, Yvonne… the link to the give-away isn’t going to the right page. Thanks so much! I fixed that! 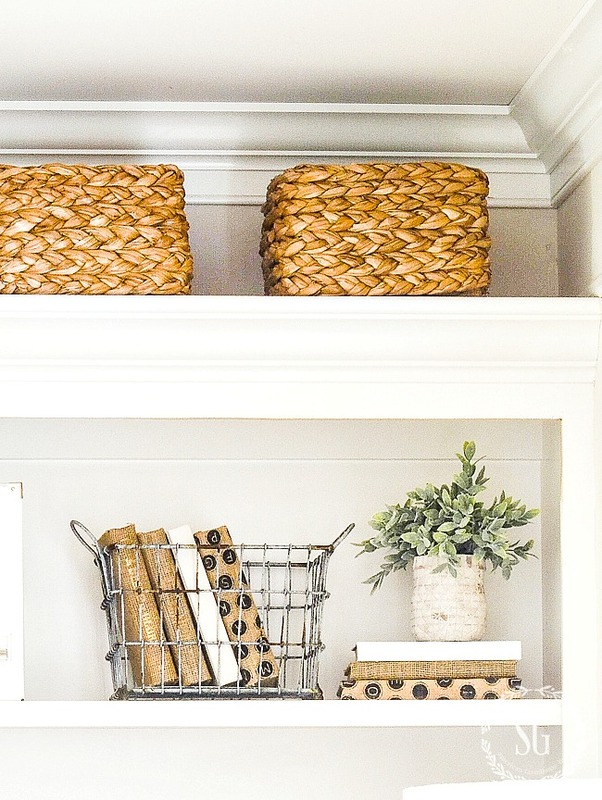 Thanks for all of the great bookshelf ideas..The first time I came across your website I saw your bookshelves and went out and bought black canvas baskets and did mine. I love the idea..hides a lot, too! I keep some of my holiday things in one that I can easily pull out as I start decorating for different seasons. Love your tips and ideas.. The only bookshelves we had were part of a huge custom built entertainment system which housed our TV in the middle. We took it out of the room, and I found a buffet which we used to set our TV on. It brought it up to a higher level, and we didn’t have to hang it on the wall, Plus, I now have all of that great storage for my extra dinnerware and such. The buffet wasn’t meant for this purpose, but it totally works for us! Thanks for the great tips on styling bookcases. Your bookcases always look great – no matter how you style them. I always feel good after I’ve re worked an area in the house. Bookshelves, entryway etc. it’s a nice refresh and I really love the copper accents on your bookshelves. It makes me feel accomplished to Lynn. Such a great feeling! 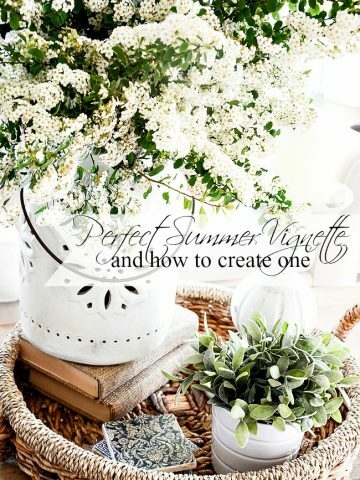 I just finished reading my latest issue of The Cottage Journal and was delighted to see your beautiful home featured. Thank you for all your tips and inspiration. I LOVE DT&T and look forward to each episode. I also have a “thing” about placing a television over the fireplace and always try to hide ours behind doors. I’m not a fan of open book shelves as they need to be really decluttered to bring calmness to my rooms. I recently pirchased a beautiful entertainment set and I’m constantly saying I need to declutter it. Never comfortable of the balance of pictures, mementos and stuff. I’ll know it when I get there. My hubby says it needs to be functional and I like paired down simplicity. Not a fan of too many baskets, as it draws the eye to it immediately. What a conundrum. I really like the uncluttered look of your bookshelves. They can be such a challenge to decorate. Like you, I have not been a fan of hanging a tv over the mantle. Not my idea of a focal point, lol. I do LOVE your style and would love to go shopping and puttering with you! I have pinned, printed and used many things from your blog. I am just wondering ….am I the only follower who is not into covering or painting books? As always, I continue to enjoy each addition to your blog. Dividing the shelves into an imaginary 9 sections is a good idea! Oh and I definitely agree with you on the tv not being placed above the fireplace. I enjoy decorating the mantel! Although, my husband wants the tv there and placed an outlet in the middle of the wall above the mantle. So, that is always frustrating to work around! That looks great Yvonne. Simple and attractive without a lot of work. I like that! Love todays post! SImply perfect. Love the baskets on your shelf. I also have a wire basket on my open shelves in the kitchen with a couple of cookbooks in them and like that. I see Stone Gable is in the Autumn edition of Cottage Journal! Congratulations! Just lovely! 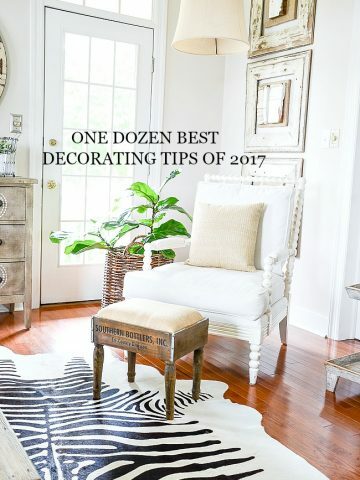 Thanks so much for your inspiration and tips, and tricks and ideas to make us all better decorators . Thanks, Connie! I do not have a copy yet. But I’ll get one today. I enjoy seeing posts on styling bookshelves. Changing up mine is another part of my seasonal decor but I also use some of my many gardening books stacked but changed periodically. Never can have enough shelves! I have baskets similar to yours but use them to store my magazines. Can’t seem to part with some. Thanks for the ideas Yvonne. I have a small built in bookshelf at the moment and got it perfect. After reading this blog, I want to shake it up a bit. Tweaking time. I like the idea of using an imaginary grid. Great idea! 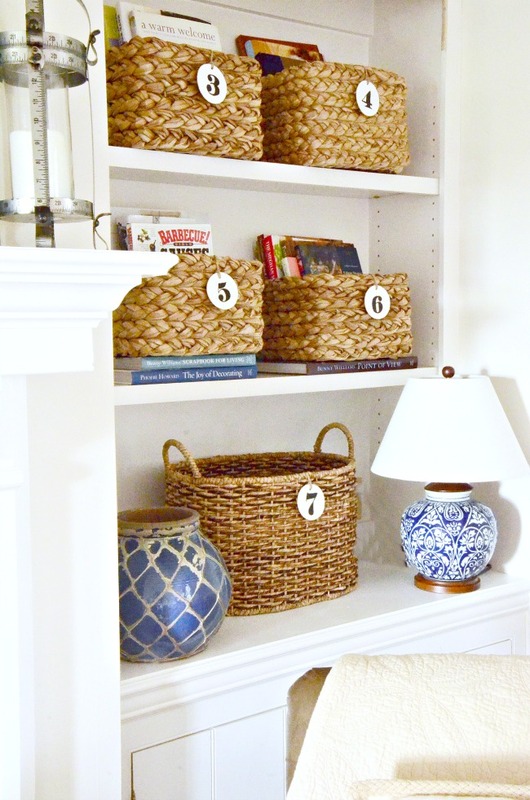 I’m a creature of habit, so I like the bookshelf the original way better…with all the baskets numbered like Pottery Barn. However, I do understand the need for change…sometimes I’ll change something (after I take a picture) and then change it back after a month or so. For me, I display my books along with my favorite items. I consider my books to be a collection of favorite authors or from travels, which gives an individual that’s visiting a sense of who I am. While at the same time, I don’t have built-ins in my current house. So, my bookshelf are in the guest bedroom and hallway, which lends itself perfectly for guests to possibly find reading material during their stay. Was browsing magazines this week and was pleasantly surprised to see Stonegable featured.Absolutely beautiful! When I grow up I want a house like yours.ha ha Congrats Yvonne! I LOVE your blog! I’m so glad you saw the article. When I grow up there are many things I want to do too! Decorating bookshelves, or even a single shelf can be so challenging! Thank you for these tips. Such great ideas! Also, on a side note, I really like how you mix in black with your neutrals. Love all your ideas, Yvonne!! Your home is lovely. Thanks for sharing and enjoy the day. Yvonne I have the same set up, fire place and book shelves on either side. Trying to figure how to arraign everything, so thank you so much. As always you have amazing ideas, thank you. 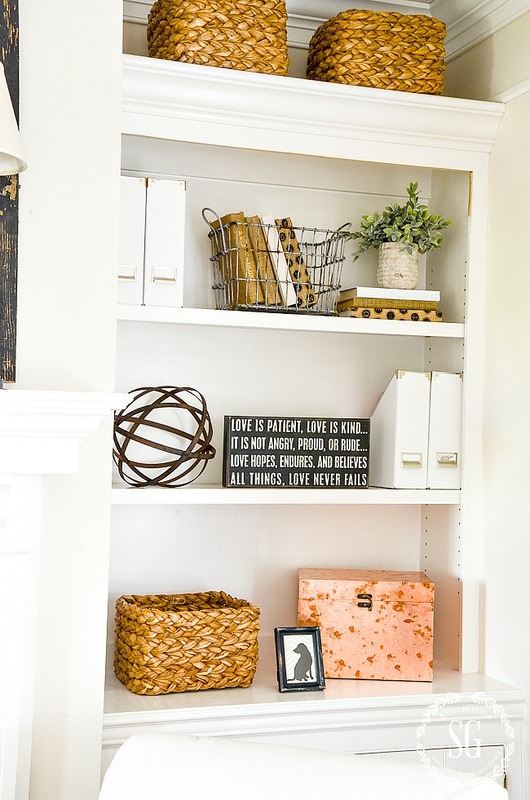 Great tips for styling shelves without books…pretty refresh, Yvonne! 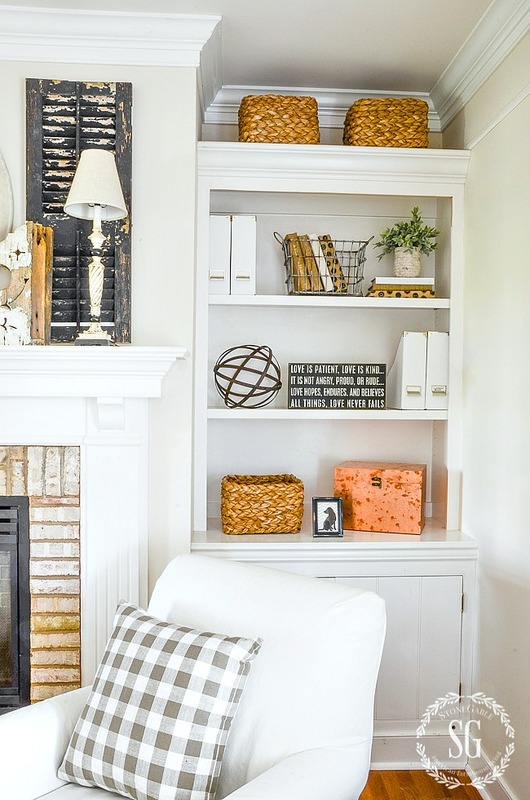 Great tips on styling bookshelves! Really cute. I love the wire basket, you made it work with so little. I have no bookshelves but love looking at how you decorate them. Nancy you can use these ideas on any flat surface! Hope you find a place in your home to freshen up! Nice refresh for the shelves. Always good to change things up! happy, happy, happy! my fav shelf is the wire basket with books, & can’t wait for the copper to distress. I’ve kept some of my Mothers old old books and put the page side to the front. I have a smaller house so our living room also serves as a family room. I need to use our book shelves for my books, no where else to put them! I still decorate by using the top two or three shelves to display family pictures and part of my ironstone pitcher collection. Thanks for the tips on how to organize the shelves so everything looks organized. I’m not sure I like the TV on your book shelf. It looks out of place to me. But, I understand that it needs a place to go as well. At the present, our TV sits on a table-like TV stand. I’m saving up for a white entertainment center, which will also have book shelves on each side of it! I know some say entertainment centers are out of style, but I love them and need one for better organizing my living room. A custom cabinet maker will be my source for making it. The entertainment center will make such a difference in our home. The shelves look nice either way, but I love the basket (No. 1) look the best! I understand the need to change though, as I frequently move things around also! Great ideas! Love your shelves.